A clean and effective way to maintain cigarette waste, commonly wall mounted in outdoor smoking areas. Made of galvanized steel with a tough powdercoated Dark Gray finish. 4 front disposal apertures and 2 stubbing areas. 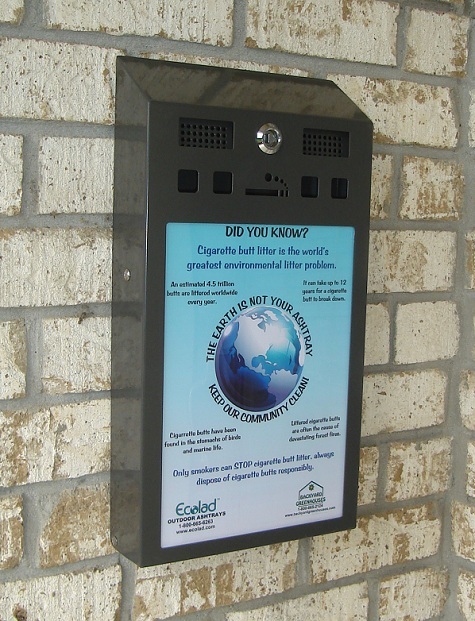 The poster is protected by a durable clear polcarbonate sheet and is easily removed in the event you want to insert your own customized information or promotional message. 3 predrilled mounting holes in back of unit; mounting hardware included. Available in Dark Gray only. Capacity: .75 gallons / Approx. 750 butts. A clean and effective way to maintain cigarette waste,..